Hi friends, I finally finished crocheting the border for the crocheted granny square blanket. Here is what the blanket looks like laid out on the floor. For the final border on the blanket I half double crocheted all the around the blanket. I kept the border simple and I love the way the blanket and border looks. In case you missed the post on the pattern and yarn I used for this project you can find it HERE. I really enjoyed working on this blanket and it feels good to be finally finished with it. I will be donating this blanket that I made to the Christmas Fair that we have at our church. I hope I may have maybe inspired you to crochet or knit something. Thanks for stopping by and wishing you all a wonderful weekend. See you all next week. How beautiful Julie! What a nice size that blanket it, would be great for a throw. You have a beautiful weekend as well. Beautiful blanket - it's always so nice when a project is finished, isn't it. You did a great job. It's lovely! I really like the colours you've used, it looks lovely and snuggly! Julie, it is just lovely! I really do wish I could crochet! Still thinking about making it a priority to learn this summer! :) Thanks for the inspiration! The border looks perfect for the blanket. How kind of you to donate it to your Church's fair. It's sure to find a happy home. This is absolutely beautiful! I love the various shades of blue color! You did a fantastic job with this! Julie, you did a fabulous job! I love the shades of blue. The border and body are beautiful :D Have an amazing weekend. Hi Julie! Just wanted to thank you for stopping by each weekend to link up with my no rules weekend party!! 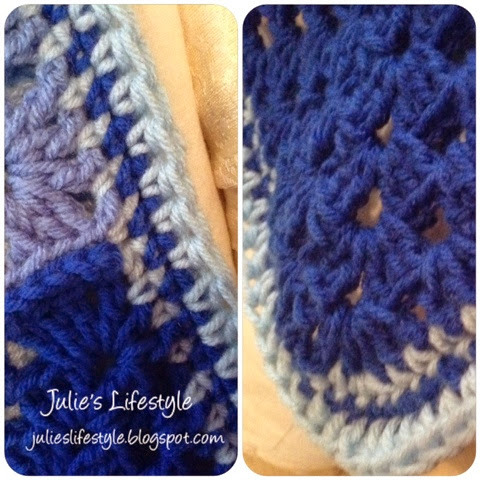 Hi Julie, the blanket is so pretty and it's so easy to think someone will love it! Hi Julie, that's a pretty one! My interest had shifted from blanket to making shawls of late... :) may be the hit weather. Thanks so much for coming to our party Julie. Angie just became a grandmother of a little boy and this blanket would be perfect. Yes, you do inspire me to crochet again. It's beautiful Julie and how sweet of you to donate it! Someone will be happy to buy it and snuggle up in it! It would be nice for either a lady or man as well. Hope your weekend is going well. Great job on the blanket Julie. Someone is going to love it! I posted Part 2 of Country Folks if you are interested!! Very pretty - love the colors~Thanks for sharing on the Four Seasons party. Hope you join us this week with another one of your creative projects! Your blanket is beautiful! I love the border. It almost looks like a stitch. I'm finishing up an afghan I hope to share soon. Thanks so much for sharing with Creative Spark Link Party. Really gorgeous! I love your color choices! Great job! I found that baby blankets are more my size - props to you for getting this afghan done! I really like how you did the border in the lighter color and then the blue and then the lighter color again. 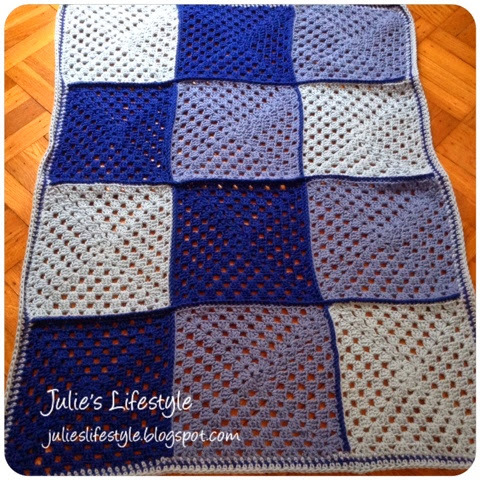 What a beautiful blanket, Julie! Granny square blankets are always so much fun to make. Thank you for sharing at my Yarn Fanatic Party, and I hope that you'll share something this week too! Hi Julie, I love granny square blankets. Yours turned out fantastic. Such a beautiful fabric. Thanks for linking up to Funtastic Friday. Hope to see you again this week. This is just gorgeous. Thanks for sharing with us at Funtastic Friday. Hope to see you again this week.